" Emma's understanding of horses and people is beyond her years. It has been a huge privilege for me to learn Emma's Intuitive Horse techniques which have not only helped me understand myself better but also understand horses in a completely different way. Working with heart and soul this week with Emma has been the most rewarding learning experience I have ever had. It was lovely to be brought so deeply in touch with my heart and spirit. What Emma teaches goes far beyond horses and helps us to be more in touch with ourselves and all of life"
I absolutely loved the 3 day retreat! As someone who has never been around horses before I did initially feel a bit nervous about getting close to them. Another participant amazed me by sitting on the ground near a horse- something I didn't think I could do! But when it came to my turn I surprised myself by doing the same thing- it just felt like the most natural thing to do in sharing the space with this beautiful being. I felt a deep sense of trust between us. Emma created a very safe and supportive atmosphere and I would say to anyone who likes the sound of the work but feels a bit scared or apprehensive to just give it a try. For me it felt like the most wonderful gift to spend time with the horses, to connect and just be with them. I've never been so close to horses without both parties being up on their feet, horse tacked up and ready to do what I'M expecting to do. You simply don't get the opportunity at riding schools to be among the horses, who are at total liberty, no human agenda, free to do as they please, when they choose to, on their turf (literally) and just have the chance to cut everything back to basics and just ... 'be'. It's a real credit to Emma that her horses ARE so relaxed and so chilled around humans. So often, we only ever see the opposite. I wanted to let you know, how very valuable Grace found her sessions with you and your lovely horses. It has really helped her to understand that how she is with people, can have a big impact on how people will react to her- such an important concept to grasp. As an experienced counsellor who has seen many types of therapies, imagine my scepticism when it was suggested to me that I might like to try a session or two of INTUITIVE HORSE, especially as I am not a ‘horsey’ person. Believe me, this is powerful stuff - I soon came to realise that horses are amazingly perceptive and just by being and tuning into them you begin to get in touch with your deepest buried emotions. I cannot recommend Intuitive Horse enough. Thank you for a lovely retreat. It certainly was thought provoking and a lot of fun too. I cannot believe how quickly the 3 days went. I still keep thinking about Ruedi and how funny he was and feel very lucky to have experienced horses in this way. What an eye opener! I think Emma has great skills as a facilitator. She is very good at picking up small details and nuances and gently pushes people to go their one step further in thinking about themselves and facing sometimes painful realities. Many thanks for that! The retreat surpassed all my expectations! I enjoyed every minute as everything was so carefully structured- the exercises we did followed by the work with the horses. The setting was absolutely perfect and we were well taken care of with delicious lunches and lots of biscuits and hot drinks. The other people in the group were lovely and we gelled really well and I so respect everybody's sincerity and honesty. Every regard was also given to our wellbeing and safety. I was excited at the thought of taking part in an Intuitive Horse Session, but did not know what to expect!! I had to first of all choose a horse, but soon realised that was the horse's decision to make! The first thing that I had to learn to do, was to open up and trust that the session would take its own natural course. I found this quite hard, as having been around horses all my life, it was a completely different way of being with a horse. Once I was in the pen with the horse, I touched him on the neck and closed my eyes, and just tried to connect with him. Once I had that connection, the horse gave me a very powerful message, at which point I became quite emotional. It taught me how to address what was missing in my life, and made me face up to emotions that I had been supressing. After the session, I felt very enlightened, positive, with a new direction to take. The whole experience is unique and empowering, and I can wholeheartedly endorse Emma Ross's work. Wow! I had the most amazing 3 days Emma - so many shifts, realisations, deepened awareness and strength gained from your retreat. You offer such a gift - THANK YOU and your beautiful horses for such a great time! I have had a really lovely time on the retreat and the benefits I hope will last a life time- a million thanks. After a break from horses of nearly 20 years, I decided last year that it was really time to have them back in my life. I had ridden as a child, and was lucky enough to have had my own pony. I knew that this time I was looking for a new approach; something different from the traditional riding school experience I had had as a child, but I had no idea where or how to find it. 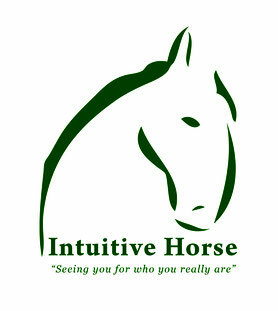 So, when I came across the Intuitive Horse website it seemed perfect. To begin with I had a couple of Intuitive Horse sessions with Emma, which gave me an insight into some new ways to engage and communicate with horses. I quickly realised that in the longer term a horse share with one of Emma’s horses was the ideal way for me to explore a new relationship with horses. At the beginning of this year I started my share with the lovely Cliff. On my share days I can spend as much time with him as I want; grooming him, looking after him, and working with him in the sand school either loose or in hand. At the moment this doesn’t include any riding, which is actually great as it gives me the freedom to explore so many new ways of getting to know him. Each time I visit Cliff I learn a little more about him; what he likes, what he finds challenging and also what he can teach me. In fact in the last few months I think I have learnt more about myself than I have about Cliff! So, if you love horses, and are looking for a new experience with them, and for yourself, I would really recommend getting in touch with Intuitive Horse. "I only properly got into horse owning 6 years ago, before that I was a keen but only occasional riding school rider, not having my own horse or having much knowledge about them either. 6 years on I’ve qualified as a facilitator of Intuitive Horse and have small herd of 3 horses. As I look back over the course I am only now fully realising just how much Emma’s training is way beyond what it seems to be on the surface (which is already incredible). Over the years spent with Emma on her retreats and then on the I.H. facilitator course I have learned to read horses and understand their language. Emma has taught me a pure and respectful way of being around these beautiful creatures and helped me to understand their core nature and their ways of communicating. Once you can read a horse, everything changes in how you relate to them. I used to look to ‘natural training methods’ for guidance when I first set out as a horse owner, but now I don’t see them as natural at all. Learning to read the subtlest of signals a horse gives as communication has allowed me to understand them at a profound level and also to find my own way to communicate with them, without the need for methods or training aids. I have learned a different way to be around horses and to allow them to be themselves around me. I can’t recommend this course enough, whether you become a facilitator or not it is a training that will truly enrich your life." I LOVED every minute at the retreat!!!! It was such a great journey for me!!!! What the horse taught me was amazing and so true. I feel so much more confident and connected to myself. Thank you so much Emma and to all the horses!!! It was such a amazing experience that I will use everyday and never forget.